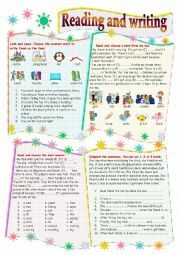 A worksheet practising comparatives and superlatives. 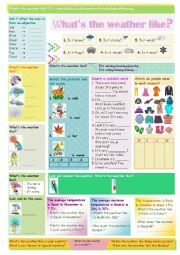 A worksheet involves practising writing and speaking about the weather.Hope it´s useful. Thank Jecika for your nice template. Thanks for downloading. 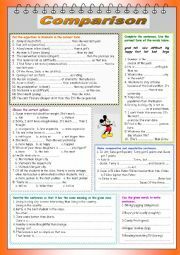 Students have to look at the pictures, then fill the blanks with " both... and" , "neither ... nor", or "either... or." A slight explanation of the diffence between them and six dirrent types of exercises. Hope you enjoy it. 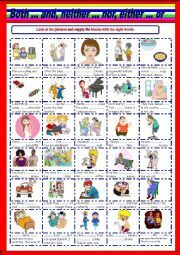 Special thank Zailda for her wonderful template. 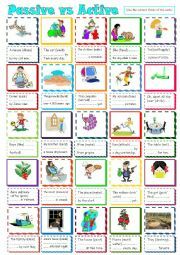 Students have to look at the pictures, then choose the correct form of the verb. 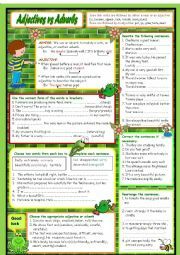 Students have to decide whether the sentences are active or passive. Have a good day. 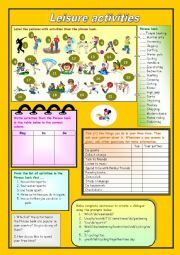 A worksheet with lots of practice on leisure activities. 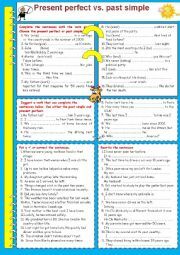 Worksheet practising the present perfect and the simple past. 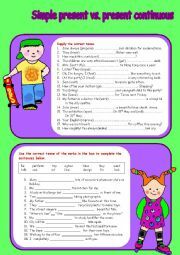 A worksheet involves practising the simple present and present continuous. 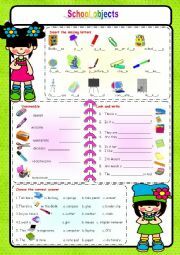 A worksheet consists of 2 pages with 8 different types of exercises : insert the missing words, complete the sentences, match the pictures and the wordds, rearrange the sentences,answer the questions,choose the correct answer, look the pictures and write and unscrambling words.